Yulia Matochkina began her career in 2008 in the Academy of Young Singers of the Mariinsky Theatre. 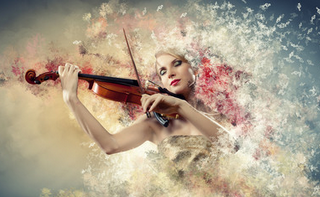 Since her triumph at the XV Tchaikovsky Competition in 2015, where she became a gold medallist and 1st prize winner, Yulia Matochkina became a soloist of the Mariinsky Theatre. 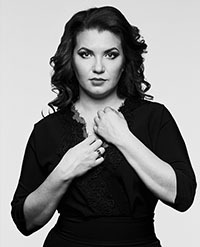 Yulia is currently one of the three leading mezzo soprano of the Mariinsky, performing major roles such as Eboli in Don Carlo, Principessa de Bouillon in Adriana Lecouvreur, Dalila in Samson et Dalila, Didon in Les Troyens, the title role in Carmen, Marfain Khovanshchina, Brangäne in Tristan und Isolde, Ježibaba in Rusalka, Dulcinée in Don Quichotte, Charlotte in Werther, Nicklausse in Les Contes d’Hoffmann, Olga in Eugene Onegin, Polina in The Queen of Spades, Clara d’Almanza in Prokof iev’s Betrothal in a Monastery, the title role of Mussorgsky’s Salammbô and the mezzo-soprano part in Verdi’s Requiem. She has joined the Mariinsky and Maestro Gergiev on various tours and in concerts in Tokyo, Shanghai, Baden Baden, Barcelona, Edinburgh, Rotterdam, Cardiff, Astana, Paris, Munich, New York and many more. performances at the Bolshoi Theatre and the Mariinsky Theatre, as well as the highly anticipated role debut as Amneris in Aida.